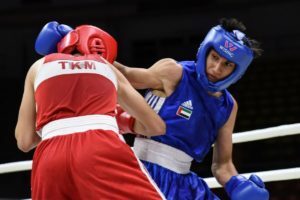 Turkmenistan Boxing Federation hosted their first competition in 2019 the Youth National Championships in the recent days. The national event delivered full of surprises in Ashgabat where Yunus Shamsiyev, Eziz Muhammetmyradov, their No.1 Shukur Ovezov, Amanmyrat Baygeldiyev and Azat Jumayev were the bests. Boxers who were born in 2001 and in 2002 were eligible to attend in the Turkmenistan Youth National Championships where 10 new winners have been crowned. Turkmenistan will be sending their best youth boxers to the upcoming international events including the 2019 ASBC Asian Confederation Youth Boxing Championships. Ashgabat’s Parahat Hummedov was only quarter-finalist in the 2017 Turkmenistan Junior National Championships and claimed bronze in the last edition of the Youth Nationals in 2018 but this time he impressed the crowd. The 17-year-old boxer had a tough semi-final against Vahid Rozmetov but following that success he was able to beat also Annageldi Bayrammammedov in the final of the light flyweight (49kg). Dashoguz’s first gold medal in the Youth National Championships was delivered by last year’s Junior National Champion Shyhmyrat Romonov who had his key bout in the quarter-final against Isageldi Nurlyyev. Following that close success the 16-year-old talent defeated Shamurat Muhammedov and Allamyrat Hojadurdyyev during his road to the title of the flyweight (52kg). Ashgabat’s Yunus Shamsiyev was the main favourite of the bantamweight (56kg) but he had to do his very best to get the title. Shamsiyev was slightly better than Kadyrjan Jorayev in the quarter-finals and he had to meet with his main rival Lebap’s Meylis Hamrayev in the semi-finals. Shamsiyev won their bout by split decision and walked over to the gold medal following his opponent Jorakuly Dovletov was unable to box against him. Ashgabat’s Atajan Hudayberdiyev arrived to the Youth National Championships as the main favourite for the gold medal of the lightweight (60kg) but he suffered an unexpected loss in the semi-final to Dashoguz’s Umar Rozmetov. Ashgabat’s Junior National Championships bronze medallist 16-year-old Eziz Muhammetmyradov eliminated Islam Gurbanov in the second semi-final and defeated also Umar Rozmetov in the final. Shukur Ovezov is the most experienced youth boxer in the current age group in Turkmenistan who achieved his first national title as schoolboy in 2014. The 17-year-old boxer attended in the Children of Asia Games, at the Agalarov Youth Cup and at the Aitenov Brothers Youth Tournament therefore his international experiences was too strong for Shukurmyrat Gurbanov and Geldymyrat Baygeldiyev in the final stages. Ashgabat’s Amanmyrat Baygeldiyev caused several surprises in the Youth National Championships where he won the title of the welterweight (69kg). He defeated Junior National Champion Dayanch Orazmedov in the semi-final and stopped two-time Junior National Champion 16-year-old Rahmetjan Japparov in the gold medal bout. Lebap’s Azat Jumayev won two national titles in the junior level but he was not the main favourite at the middleweight (75kg). He eliminated Balkan’s Muhammet Abdullayev in the semi-final and Ashgabat’s top favourite defending Youth National Champion Ezizmuhammet Pazzyyev in the final. Both finalists were Junior National Champions in 2017 but this time the younger Jumayev was able to win their key contest by split decision. Mashat Mashatov claimed silver medal in the last edition of the Turkmenistan Youth National Championships in 2018 which he changed gold at the light heavyweight (81kg). The 17-year-old boxer had a tough semi-final against Atamyrat Babakulov but he proved better performance against Nurmuhammet Myratgulyyev in the final. Lebap’s Junior National Champion and last year’s silver medallist from the Youth National Championships Bayram Begmyradov eliminated Dashoguz’s Junior National Champion Yahyabek Usmanov in a hectic semi-final and won the gold of the heavyweight (91kg) against Myrat Tachmyradov. The last title of the event was taken by Ramazan Hydyrov who was slightly better than Junior National Champion Ayaz Chopanov in the final of the super heavyweight (+91kg).